Size: 6.1" x 2.9" x 1.0"
The BA-45 Micro Business Manager was one of the nice applications of the miniaturized printing technologies introduced with the TI-5000. The calculating capabilities of this 4-bit microcontroller (uPD7500 series) are less than a BA-II. A similar product was launched with the TI-45 Micro Scientific Printer. If you need more powerful financial functions and like a alphanumeric prompting you should go for the Canon Financial Printer. 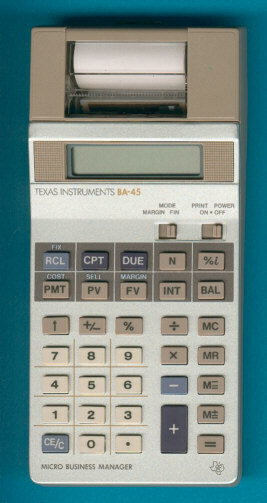 The only serious desktop printing calculator developed for financial applications was introduced already in 1983 with the rare TI-5310.